Gov. Bill Ritter today hailed the grand opening of the Coyote Gulch algae-to-biofuels pilot facility in southwest Colorado, a first-of-its-kind project by Solix Biofuels Inc. and Southern Ute Alternative Energy. The Coyote Gulch Demonstration Facility is expected to produce the equivalent of 3,000 gallons per acre per year of algal oil by late 2009. The facility is located on two acres of Southern Ute tribal land. The company, which also operates in Fort Collins, has 50 employees, and about 10 of them will work full time at the Coyote Gulch plant. Founded in 2006, Solix develops low-cost scalable photo-bioreactors where algae grows inside plastic bags in place of open-pond conditions. The goal is to create a commercially viable biofuel that will help solve climate change and petroleum scarcity without competing with global food supply. Categories: energy, environment, politics, space | Tags: biofuels, clean energy, CO2 recycling, Gov. Bill Ritter, Inc., renewable energy, Solix Biofuels, Southern Ute Alternative Energy, water recycling | Permalink. I’ve wanted to blog about this for a while: NOAA scientists announced earlier this month that a new El Niño has officially begun. More correctly identified as the El Niño-Southern Oscillation (ENSO), it is a climate phenomenon with worldwide impacts. Fewer Atlantic hurricanes tend to form when there is an El Niño. Rainfall patterns around the world are affected: some places see intense droughts while others experience record-breaking rains. On top of all that, there is now a higher chance that we will see a new global yearly average temperature record in the next few years. It will do so because it is a short-term climate modulation, the largest variable in the natural dynamical variability of the climate system. Previous global temperature extremes have been set during El Niño years: i.e. 2007, 2005 and 1998. Now, I’m not saying that 2009 is guaranteed to be the hottest year on record. There’s a good reason for that: a few months ago, the planet was emerging from a moderate, but long-lived La Niña event, which helped to mute the human-forced temperature trend for a couple of years. Note that 2008 was still warmer than every other year in the 1990s except 1998. So I would expect 2009 to continue to be abnormally warm and maybe 2010 will take a crack at the 1998 temperature record. Not that that’s a good thing – but it will prove all of the climate change denyers and delayers wrong one more time. Perhaps record warmth in the following months will help convince the U.S. Congress to pass a robust climate action bill. Don’t worry – I won’t hold my breath over that either. Categories: environment, global warming, science | Tags: El Niño, ENSO, global temperatures, NOAA | Permalink. Dengue Fever Will Spread Through The U.S. Some effects of climate change are direct and fairly obvious: higher temperatures in the winter; warmer temperatures at higher elevations; higher sea levels (though this varies from region to region, as recent research has discovered); acidification of the ocean as excess CO2 piles up in the atmosphere since geologic processes can’t operate on the timescale that humans can. Some effects will come about as a result of two or more other effects combining: movement of ecosystems poleward and higher in elevation; extinction of species since they can’t evolve on the timescale that humans are forcing the climate. One of those complex effects that aren’t obvious in model output data, for example, is the future spread of disease. With warmer temperatures and more water vapor in places that were more moderate in their pre-21st century climate, new diseases will become something to watch for. One of those diseases will be dengue fever. If you haven’t heard of that, you’re not alone. Dengue fever is a viral, tropical disease vectored to humans by mosquitoes. Symptoms include severe headaches, muscle and joint pain, fever and rash. Left untreated, it kills its host. 2.5 billion people are currently at risk from the disease. As more U.S. states continue to see yearly average temperatures increase, mosquitoes carrying the disease will spread further into the country. What was a disease of poorer countries closer to the Equator will begin to affect richer countries. Oh, don’t think for an instant that the effect will be seen across all demographic lines here in the U.S. As with most other diseases, dengue fever is more likely to affect poorer Americans. Categories: environment, global warming, science | Tags: climate change, climate change effects, dengue fever, global warming | Permalink. The state of the Arctic in July 2009 is bad and getting worse. 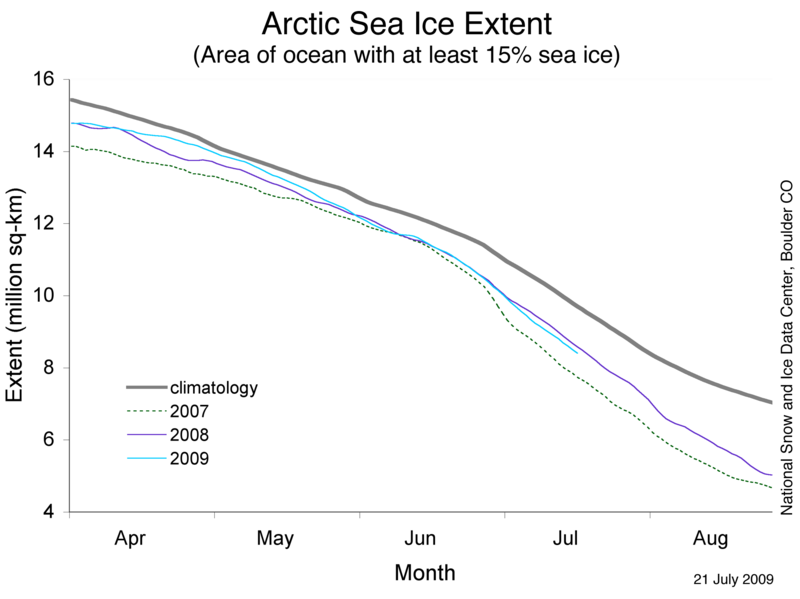 In a continuation of the trend established during May 2009, Arctic areal sea ice extent continues to be characterized as being nearly as sparse as it was in what ended up being the modern-day record low of the 2007 season. The areal extent has been below 2008’s extent on a day-to-day comparison for all of July so far. In late July/early August 2008, the weather situation in the Arctic was such that very rapid melt caused a precipitous decline in areal extent. A similar, almost-as-rapid decline has taken place this July. As I will show below, the difference between my last post one month ago and this post is dramatic. It is useful to keep in mind that there is a lack of multi-year ice in the Arctic, as I’ve detailed before. Why is this important? One- and two-year old ice is thinner than multi-year ice and is thus more susceptible to fully melting during the Arctic summer, especially in the face of less-than-optimal weather conditions for a week or two. One factor working against record low areal extent is the decreasing amount of solar radiation impacting the Arctic. The sun is sinking lower and lower in the Arctic sky every day and will continue to do so through the end of the calendar year. Lower solar incidence and cloudy conditions could prevent another record low areal extent from being set. Categories: environment, global warming, NASA, science | Tags: Arctic climate research at the University of Illinois, arctic ice, Arctic ice sheet, arctic sea ice, Arctic sea ice extent, climate change, global warming, National Snow and Ice Data Center | Permalink. The Blue Dogs aren’t the only caucus in Congress flexing their muscles on the health care debate. The Congressional Progressive Caucus sent a letter; to Speaker Pelosi on Friday making their case for what will be required to garner their support for health care legislation. The CPC is a strong and vocal advocate of a single payer approach. Nonetheless, we stand solidly behind our criteria for a robust public health insurance plan option. We want to assure you that for our continued support, the public option must not be based on any trigger and must be available immediately. Further, the public plan must be on a level playing field and receive the same subsidies as private plans in the Health Exchange. And, it must be connected to the Medicare infrastructure, including the provider and payment system. Allowing providers to opt out of the public option has already created a loss of $91 billion in savings. We cannot tolerate further weakening of the public option. Categories: health care, media, politics | Tags: Congressional Progressive Caucus, health care, public option, single-payer | Permalink. Xcel is proposing a 2.6 cents per kilowatt hour fee to provide electricity from the grid. That fee would be tacked onto the electricity rate that Xcel charges every customer. So those with solar panels would be charged more per kilowatt hour than those without solar panels. That’s also on top of the $7 or $8 “service fee” that Xcel charges to cover meter reading and billing. The only spot of good news from this proposal is that existing solar customers would be grandfathered in – not subject to Xcel’s new fees. If a person’s house is already hooked up to the grid and has been drawing power from dirty energy for any length of time, what justification could Xcel have to charge that person more per kilowatt hour if they install clean energy and reduce overall demand from our antiquated and overused energy transmission system? Moreover, solar panels can easily generate more power than an owner uses while collecting the energy. Customers are credited for that excess energy because it is used by the rest of Xcel’s grid. Thus, Xcel’s transmission and generation costs are actually lowered by these customers. So future customers will be penalized for that service? Do Xcel customer’s have the ability to go to the PUC and demand that the energy they sell to Xcel should match the highest rate they have to pay Xcel? If they don’t, then energy producers don’t have equitable access to the energy market, do they. I can envision this doing one of two things. The first is it puts a crimp on the future growth of solar panels in Colorado. Why would people, especially in a severe recession, pay thousands of dollars to put in solar panels and then be charged more per kilowatt hour for the same electricity that their neighbor would be charged? It’s easy: solar panels are less desirable in such a market, ensuring that we remain stuck on dirty energy longer, thereby raising the cost of future climate change mitigation. The second is it drives people to go off the grid. If people can generate and store the energy they produce, what use would they have for an energy corporation whose primary purpose is to generate a profit? And before this second scenario is dismissed out of hand, realize that energy storage technologies will continue to advance. Add in upgrading a home’s energy efficiencies, ability to generate its own power and store excess energy, and the Xcel way of business doesn’t seem so stable or profitable. Gov. Bill Ritter said today [July 23] he will oppose the federal government if it moves ahead with a proposal to ship thousands of tons of mercury to a waste storage site south of Grand Junction. The risks to ground and surface water are too great. The risks to our air quality are too great. The risks of transporting elemental mercury over long distances and on routes that run adjacent to or cross major water sources, such as the Colorado River, are too great. That sounds really great too. Um, Gov. Ritter, I have a question: if you’re willing to refuse mercury storage, why hasn’t the state done more to stop toxic chemicals from being forced underground in order to drill out gas and oil? I realize there are some differences in the two cases (government vs. corporations being one), but shouldn’t the quality of our ground and surface water be fought for, regardless of who could potentially foul it? Thanks go out to Brahman Colorado, whom I met for the first time yesterday. Fracing was the topic of a very good discussion, and this mercury announcement put it into even further context for me. Categories: business, energy, environment | Tags: hydraulic fracturing, mercury storage, solar energy, Xcel Energy | Permalink. Last night, I “discovered” Planet Green, a channel on cable that is put together by Discovery. I’m pretty impressed. It has been up and running since June of last year. I watched a program on the Solar Decathalon from 2007 – universities building green homes in a competition every other year in Washington, D.C. There were some really cool designs – I wish they would have spread this one out a bit more or would follow up examining some of the technologies/plans the schools presented. Then I watched a program on Greensburg, KS, the town that was literally wiped off the face of the Earth in May, 2007. I was hoping for more about the green features the town is planning (i.e. Platinum LEED for every city building), and at the end I figured out why the show seemed to be moving too slowly to do so in an hour: it’s part of a series, which isn’t a bad idea. The bad news is, I’ll have to spend some time trying to figure out when the next episode is going to air. This morning, as I was getting ready for work, the channel had a program on about green roofs in Chicago, IL. They did a very good job presenting the advantages of green roofs: lower energy costs, lower building temperatures, improved water handling in an urban setting, etc. So far, I enjoy the programming on this station. It’s too bad it’s on the higher reaches of cable (200’s of my programming) – more people would really benefit from its lineup. Categories: energy, media | Tags: green living, green roofs, Greensburg KS, Planet Green, Solar Decathalon | Permalink.